As I agonize over how to approach Mr. Eastwood’s film, I question why it’s that way. He’s a director who has had a long and illustrious career spanning several decades, as an actor, director, and composer. Yet as I scour my memories of the films that he has directed, I can’t really call upon a singular directorial effort as being purely Eastwood. I loved his work Sergio Leone and his acting in general, but even when taken out of context, he really has aged into the man with no name. As a director, he lacks a signature, which is to say that his films cover a wide array of genres and themes that avoid particular distinction. With that, it makes it difficult to compare his films outright, even if there is some precedence to compare Josey Wales with Unforgiven. 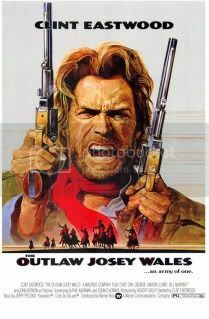 But there’s a historical context to The Outlaw Josey Wales that makes it distinct and rather tricky to judge. Should I be offended by Eastwood’s rather glib interpretation of Confederate vs. Union politics? 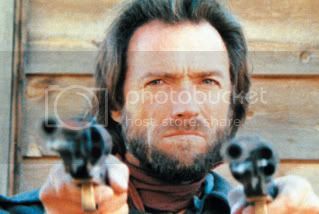 If anyone other than Eastwood starred in this film, I would probably have reevaluated my perspective on the film entirely; but the visceral qualities that he brings to this role (as with most of his roles) make it hard to not get swept up by his sense of vengeance. The gritty charisma that comes attached to Eastwood spitting out tobacco before each kill is a simple yet remarkably effective in…well, getting the audience amped up. Thematically, The Outlaw Josey Wales doesn’t convey a larger sense of grandiose or truth – it’s very much a film content with being an action picture. And for that, its measured modesty comes a long way in making the film entertaining. The plotting is straightforward enough to be described in a sentence: a young man is wanted by the law, as he kills to reach a safe-haven. The bits of exposition that spawn out of that sentence are inconsequential to the framework of the narrative at large – this becomes particularly evident by how many detours the film takes during its runtime before returning to its more focused sense of scope. So perhaps what makes an Eastwood film so Eastwood is its simplicity? I still have more of his films to go through before I can make such a bold statement about his filmography, but of those I’ve seen, Mr. Eastwood doesn’t pose questions of grand condition – he asks simple questions, replies in simple verse, and shoots the action under simple terms. This simplicity is tends to work in his benefit though, as his modesty provides for moments of entertaining bliss.